This is actually two devices in one, a straightforward spirit level bubble vials but with a recess to take a laser rangefinder and inclinometer. This is a standalone device, which gives you a battery of different functions ranging from angle measurement, distance measurement, volume, indirect, etc. Starting with the GLM 80 on its own, there are inevitably a series of buttons to configure it for each mode starting with the function button. 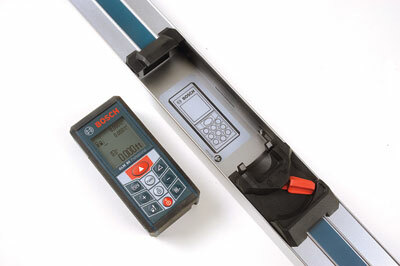 Distance measuring relies on the device being accurate to within plus or minus 2mm, so Bosch suggest doing calibration checks using a known situation between 1-10m in length, such as a room. 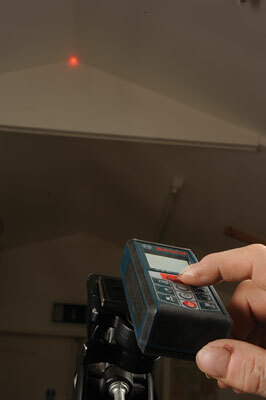 Assuming the device is correct, laser measurement is very easy although the values displayed change very quickly even with slight movement, the optional tripod would help make this more exact or, using the rear of the device as the datum, (you can set any of four different positions as a flip out point for working from corners etc) and resting it so the reading can settle. Although there are various measuring and calculating options available one of the most useful to me is the volume setting. In this mode you take three readings in a row; length, height and width and hey presto - the total is then displayed. It doesn't get any easier than that if you want cubic measurements. The angle reading mode is possible using the GLM 80 alone but for more accuracy it's best clipped into the R60 measuring rail so you can rest it on the surface you want to check. To do periodic calibration Bosch advise resting it on a table, measuring and then turning it around to do a reverse check against the first. Again, taking a reading is a doddle, although any of the displayed readings are very small on an LCD screen, which when covered in cement dust on a bright day 'on site' could be hard to read. Among the other tricks this gadget can perform is to take an angle reading from the top or bottom of a building exterior for instance, and calculate the height, when you can't measure directly up the wall as you'd be trying to read off blank sky above. Clever, and I'm sure there are circumstances where it would be very useful. This combined piece of kit seems more assured of use than the digital angle measurer, because for me it can do so many things that can be hard to do quickly and easily if at all, on site, especially in large buildings and awkward or inaccessible situations. Just do not let anyone walk off with half the kit and leave you with just the other bit. It has rechargeable li-ion cells giving up to 25,000 measurements between charges so it should be ever-ready.